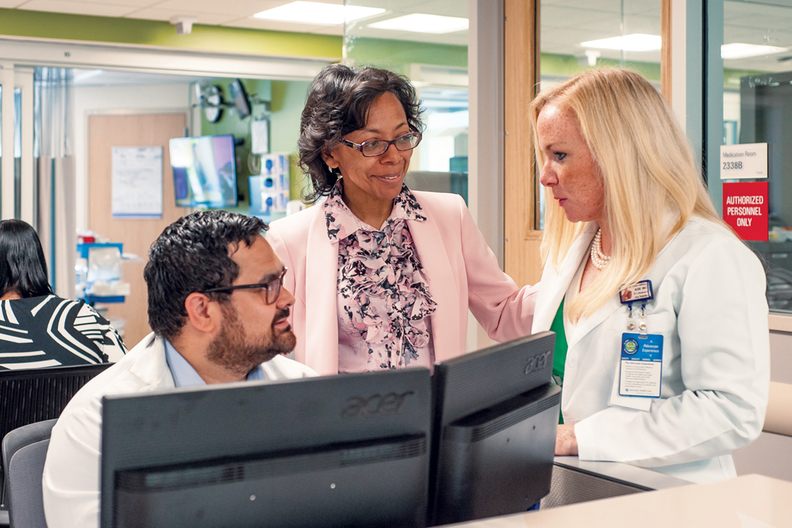 Jacquelyn Whitten, center, interim CEO at Advocate Trinity Hospital on Chicago's South Side, meets with Lue Lukan, clinical educator in critical care, left, and Kathleen Curran, manager of clinical operations for the ICU. She's also been working outside the hospital to expand community health programs. But that's not always true. Four years ago, Dr. Rod Hochman, CEO of Providence Health & Services, hired Aaron Martin away from Amazon to head strategy and innovation. Martin's team has spun out several new products to better engage consumers between episodes of care, then found venture capitalists to turn them into businesses. Martin said what Hochman hired him to do—build deep digital engagement with consumers—is taken for granted in other industries but is brand new in healthcare. Still, he doesn't think he would ever feel comfortable moving into the Providence CEO role himself. With healthcare changing rapidly, hospital CEO positions turning over at a high rate, and baby boomer senior executives eyeing retirement, some hospitals and health systems realize their next leaders will need a different set of experiences and skills to successfully navigate that new world. For example, these leaders may have to figure out how to run a “health village” rather than an acute-care hospital, a shift recently announced by Ascension's Providence Hospital in Washington, D.C. Being a hospital CEO has always been a grueling job requiring long hours, high public accountability and the ability to accommodate multiple demanding stakeholders. The new operating environment will require an even greater openness to change, willingness to listen to customers and front-line staff, and courage to radically redesign systems to improve quality and reduce costs. Incoming CEOs need a vision for how hospitals and other delivery systems will be transformed in the coming years into very different-looking organizations whose focus is on keeping their patient populations healthy in the most cost-effective ways. Physicians with strong management and people skills who grasp the entire continuum of care will be in particular demand. The traditional route to the C-suite—long years of progressively more responsible positions running inpatient hospital operations—may no longer be the best preparation, though hospital experience remains desirable. “With so much technological advancement causing disruption in the market, there is much more desire for people who are strategic, innovative, customer-focused, and can adapt quickly,” said Tom Giella, chairman of healthcare services for executive recruiter Korn Ferry. Yet many health systems and their boards haven't fully embraced the emerging paradigm and are still hiring leaders to put heads in beds, some observers say. Meanwhile, the most innovative people, who may be exactly what these systems need, are reluctant to join slow-to-change, risk-averse organizations. In Kocher's view, health systems should be seeking out three types of people for CEO jobs. The first is a big-picture clinician-thinker like Harvard surgeon-writer Dr. Atul Gawande capable of comprehensively redesigning care to make it cheaper and better. The second is a retail mastermind like Starbucks' Howard Schultz who could completely reorganize healthcare into a high-quality, satisfying consumer product. The third type is a bottom-line specialist like legendary private equity investor Henry Kravis, made famous by the book and movie “Barbarians at the Gate,” who knows how to boost productivity while cutting the labor force to hike profits. Healthcare organizations increasingly recognize they need senior executives able and willing to shake things up. Search firms surveyed by the American College of Healthcare Executives in 2016 said their healthcare clients most often named change management and innovative thinking as competencies they seek in top leaders. In the trenches, however, hospital CEOs ranked financial challenges and government mandates much higher than patient satisfaction, population health management, and patient safety and quality as their top concerns in a 2017 ACHE survey. That suggests they aren't necessarily prioritizing what many experts say is the needed organizational focus on improving the care experience and community health outcomes while reducing costs. But some aren't sure current CEOs and boards of legacy health systems are ready to change. That's why Dr. Sachin Jain joined CareMore Health, an integrated health plan and provider for Medicare and Medicaid patients, after serving in senior positions at Merck & Co. and the CMS. At CareMore, now owned by Anthem, Jain has launched a series of innovative programs including a partnership with ride-sharing provider Lyft to transport patients to appointments, a campaign to address senior loneliness, and a comprehensive diabetes prevention initiative. At the same time, however, hard-charging innovators must understand that healthcare is different from tech, retail and other economic sectors in that the stakes—for life and health—are greater and the tolerance for error is lower. New products and designs must be tested and rolled out more rigorously. In addition, it may not be easy to find health system CEOs who have both a head for tech innovation and transformation and a hands-on passion for unglamorous health promotion programs in their communities, which are key to the population health approach. A leader in the latter camp is Jacquelyn Whitten, the newly appointed interim CEO of Advocate Trinity Hospital on Chicago's South Side, who helped develop several community health programs over the past few years as the hospital's chief nurse executive. The programs she spearheaded include sending community health nurses out, in collaboration with lay health workers, to help patients manage their chronic conditions like diabetes and hypertension, and working with community organizations and a nearby junior college to train underemployed workers for higher-skill jobs. The hospital also works with the college to train certified nursing attendants. University graduate programs in healthcare management are scrambling to reshape their training of future leaders to meet the changing profile of the CEO role. “Every graduate program is wrestling with the question of how you prepare students to work in what is essentially an unknown future,' said Douglas Anderson, director of the Master of Health Administration program at George Washington University. CareMore's Jain agrees that health systems need to find ways to disrupt traditional notions of hierarchy and inject fresh thinking into their organizations. That includes putting early-career innovators into positions where they can have higher impact, as Silicon Valley firms do, rather than making them wait decades for top positions.